This report analyzes the cocoa & chocolate market by geography, type, and application. Geographically, the report is segmented into Asia-Pacific, Europe, North America, and Rest of the World. The cocoa applications covered in this report are confectionery, food & beverage, pharmaceuticals, and cosmetics. Cocoa & chocolate-based products are gaining momentum due to their various health benefits and usage as a substitute for sweets. This report estimates the global cocoa & chocolate market size, in terms of volume. It discusses the market drivers, restraints, and opportunities. The report also tracks the recent strategic activities of market players such as product launches, expansion plans, supply contracts, and partnerships & collaborations. Additionally, ten key players of the market have been profiled in this report. The cocoa & chocolate industry has gained a significant position in the food industry as they provide taste, color, and texture with several functional benefits. These products are mostly preferred during festive season such as Valentine’s Day, Christmas, and New Year. The global chocolate market, by volume, consumed 7,064.63 KT in 2013. Various types of chocolate have been introduced in the past decade. The cocoa & chocolate market is a rewarding market from the perspective of confectionery producers. Product innovations are likely to play a key role in increasing the share of the market players. Some of the key players include Cargill (U.S.), Archer Daniels Midland (U.S.), and Barry Callebaut (Switzerland). The top five players accounted for the maximum market share in the industry, by market value. The products of these companies are used by food manufacturers. Europe dominates the cocoa & chocolate market, owing mainly to the largest cocoa processing capacity of the region. Moreover, increasing population and disposable income has helped in increasing the penetration of the market in Asia-Pacific. The North American cocoa market is also growing rapidly due to the huge demand for cocoa & chocolate-based products. This report highlights three types of cocoa & chocolate in terms of value and volume. The report also estimates the market size of applications of cocoa & chocolate in the key markets of Europe, the Asia-Pacific, North America, and Rest of the World (ROW). In addition to market forecasts, the report also highlights key opportunity areas for the relevant stakeholders analyzing trends, opportunities, drivers, and inhibitors for the market. In order to provide a deeper understanding of the competitive landscape, the report profiles ten key players of the cocoa & chocolate market, and provides more than 70 market tables, categorized into type, application, and geographic regions. The cocoa & chocolate market has been growing at a fast pace. The strong demand from North America is fuelling the cocoa & chocolate market in the region. Cocoa provides flavor, texture, and color to products. Further, it has anti-oxidative, anti-inflammatory, and anti-depressant properties. The market for these ingredients is growing in developing economies such as China and India. The huge demand for cocoa & chocolate in confectionery and food & beverage industries drives the market. The promising health benefits of cocoa & chocolate in pharmaceuticals and cosmetics provides enough evidence to encourage manufacturers to consider using such ingredients. 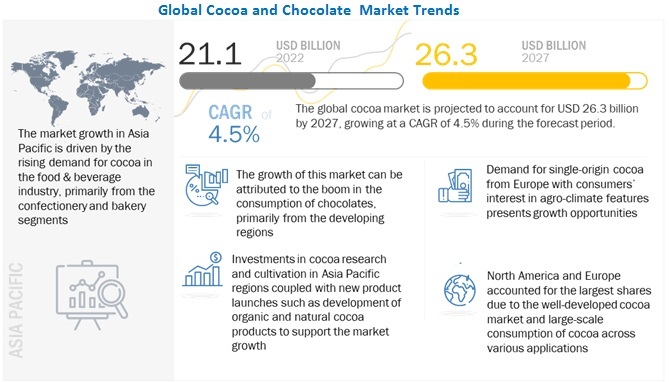 The cocoa market is expected to grow at a CAGR of 3.1%, whereas the chocolate market is estimated to grow at a CAGR of 2.3% from 2014 to 2019. Asia-Pacific is increasingly becoming an attractive market for chocolate manufacturers. 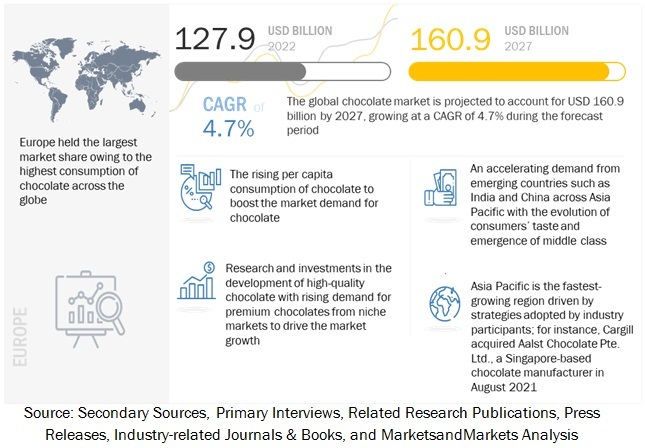 The milk & white chocolate segment is estimated to grow at the highest CAGR of 2.4% from 2014 to 2019.The cocoa liquor segment dominates the cocoa market in 2013, while cocoa butter segment is expected to grow at a CAGR of 3.8% from 2014 to 2019. Europe is the leading consumer of cocoa, followed by North America. Europe is a major processor of cocoa in the global market and is estimated to grow at a CAGR of 2.6% from 2014 to 2019. However, the overall cocoa & chocolate industry in the European region has become saturated over the last few years. Consumer awareness pertaining to health benefits has led some of the major innovations in the North American cocoa & chocolate industry. Some of the major players in the global market are Cargill (U.S.), Barry Callebaut (Switzerland), Archer Daniels Midland (U.S.), and Nestle S.A (Switzerland). These companies provide an extensive range of cocoa & chocolate-based products. 10.6 Cocoa Processing Company Ltd.
10.8 Meiji Holdings Co. Ltd.